The perfect solution for finding the ideal customers for your business by using our new Advance B2B Script, this script will help the business vendors to manage the business listing by posting the business types on well-suited categories and to get lead for the business, here in this B2B Script we have included unlimited storage and business listing categories and sub-categories for the users to post their listings. This script also helps the traders to show their listings by creating the organization events. ThisB2B Marketplace Softwareis now becoming emerging among the business competitors to show up their classified product and selling businesslistings. The Classifieds B2B Trading Marketplace Scriptis developed with open source PHP platform where the customization and modifications can be done based on the user choice with reliable and flexible. In the script, the new users can register their account by submitting the mail id and password. In choice, the user can also make the membership plans by making the online payments to get more premium lead post listings for their business. The users can easily search the business listing by entering the keyword, category, and country in the advanced search box filter. In this B2B Website Software,it is the easy way to access the buying and selling leads which are designed in the slide box. The business users can post the product list in the buying and selling leads by submitting the product name, picture, description, and ratings etc, the users can enquire the product and can buy the product by making the online payment gateway integration which is included in the system.The new feature success story is also included in the system to make their feedback about the business services and product listing. In our Advance B2B Script,the site admin has the control access to the entire site by managing the general settings, membership settings, enquires settings and buying & selling leads etc. The site statistics is enabled in the admin dashboard and the buying & selling leads report can also be downloaded for the further business listing clarifications. The transactions are managed by the admin where the package orders are easily tracked. The Classifieds B2B Trading Marketplace Scriptis designed as the world-class professional look b2btrading marketplace site with user-friendly and SEO-friendly URL to make easy access of the site. 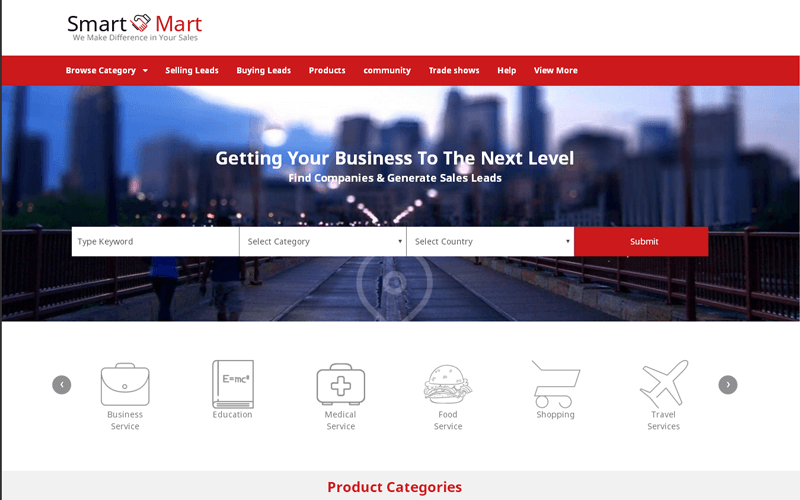 PHP Scripts Mall provides additional some benefits for the clients by providing 1-year technical support, 6-months free update, user preferable customization and brand free site. Unlimited domain with source code. Amazing support team. Their response time is fabulous. Great script with plenty of features and good improvements since I bought it. I recommend it and now it is fast ! I thank for quick support service and the explanations. I love so much B2B script that I use for my job. Thanks for PHP scripts mall.